Perhaps the best news for citizens from a wonkish Safety Harbor City Commission meeting Tuesday that was dominated by discussion of possible code changes came at the end, when Commissioner Cliff Merz shared encouraging news about the city’s treasured tree canopy. At a recent City Commission meeting, Merz asked City Manager Matthew Spoor if he could put together an accounting of the number of trees that have been recently removed in the city and how many have been planted. During his Commissioner Report, Merz shared with the audience those numbers from fiscal year 2017/2018. 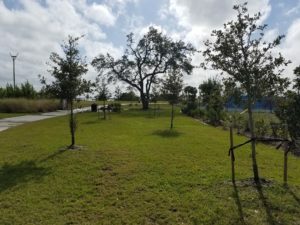 Among the trees planted in the past year were 31 that the Rotary Club of Safety Harbor planted at Safety Harbor Waterfront Park. 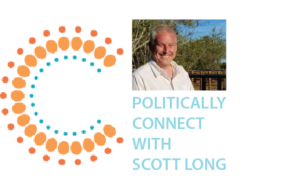 (Scott Long). The city issued 270 tree-removal permits during that time period, resulting in 353 trees being removed from residential properties and 195 being removed from commercial properties, for a total of 548. However, during that same period, 848 new trees were planted, including those required under permits, given away during the city’s annual Tree Giveaway Program and through various other ways. That means the city had a net gain of 300 trees, not counting what residents and businesses planted on their own, which the city is unable to track. The bulk of Tuesday’s meeting, held one day later than usual in observance of Dr. Martin Luther King Jr. Day, was spent reviewing 33 potential changes to the city’s codes, suggested by the city’s Technical Review Committee, city staff, the Planning & Zoning Board and residents. While a handful of the suggestions garnered discussion among Commissioners, the body agreed that only one – involving triggers for major site plan modifications suggested by the Planning & Zoning Board – should not merit future consideration. A handful of the 33 suggested changes were borne out of the contentious hearings last year over a proposed Candlewood Suites hotel in Oakbrook Plaza, a process Commissioners on Tuesday seemed to agree could have been handled better as many residents of Safety Harbor and Clearwater filled Commission chambers hoping to see Commission reject the hotel. However, since a hotel was an approved use for the land in question, Commission was merely being asked whether the applicant’s plan had met all city codes. The Planning & Zoning Board’s solution to the problem was to delete the trigger for a major site modification process when an applicant wishes to make changes to the exterior structure or parking for an existing building. That would mean city staff, not the Commission, would determine whether the applicant met city codes. Merz was uncomfortable with that process not taking place in a public meeting, and after considerable discussion, Commission agreed to not consider that suggestion, but rather to ask city staff to better clarify the scope of hearings when it sends out notices to affected residents. Commissioners, however, agreed to have city staff craft suggested changes to codes in other aspects of the Candlewood Suites hearings that may have helped clarify to residents what the city allows and doesn’t allow concerning hotels and other lodging options. The only other suggested code changes to get more than cursory discussion included two suggested by Code Compliance Officer Paul Bushee. One would require that homes that are boarded up be done so with more aesthetically pleasing Clear-Vue polycarbonate material, which looks like glass, instead of plywood. Commissioners expressed concern that the cost of Clear-Vue, which Bushee estimated to be roughly $80-$90 a sheet rather than $10-$20 a sheet for plywood, might provide an additional hardship on homeowners. The other suggestion involved temporary signs on vacant lots, and whether the property owners’ contact information should be posted, an idea with which Commissioners were uncomfortable. City staff will provide alternatives to both issues when all of the code suggestions come back to Commission in the future. Allowing mechanical equipment in secondary front yards: Commission voted 5-0 on second and final reading to approve a change to the city’s Comprehensive Zoning and Land Development Code that would allow residents to keep mechanical equipment, such as propane tanks and generators, in a secondary front yard if they are behind opaque screening. Impervious surface ratio feedback: Because the meeting was running late, Commission tabled to a future meeting a discussion on impervious surface ratio limits. Approval of Superhero 5K Run: Commission voted 5-0 to approve the Guardian ad Litem Foundation of Tampa Bay’s request to host a 5K run on the Commission’s approved 5K route on Oct. 12. Parts of Paris honored: The restaurant was honored for receiving a 2018 Florida Trend Golden Spoon Award. Safety Harbor Wine Festival check presentations: Kiwanis Club of Safety Harbor, Mattie Williams Neighborhood Family Center, Safety Harbor Museum of Regional History, Embracing Life Through Love, the Safety Harbor Public Library Foundation and Safety Harbor Partners in Progress Youth Scholarship Fund received checks from the proceeds from the city’s annual wine festival. Watch the video of the regular City Commission meeting it on the city’s website here: http://safetyharbor.granicus.com/MediaPlayer.php?view_id=6&clip_id=2069. 7 p.m., Monday, Feb. 4.